I’ve never really played with infrared photography before, unless I wanted to make a shot in the dark. However, if I ever really wanted to get frisky with the infrared, I would definitely want to get the Extech i5 IR Camera. It allows for a “point and shoot” and get a thermal image of your subject matter. 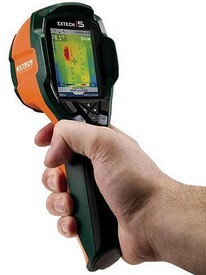 This handheld IR camera is designed for the serious repairman as it can “detect hidden problems, make quick damage assessments, check for overheating in electrical panels and transformers, avoid electrical failures, identify faults in heating and cooling systems, and find problems with motors, fans, and bearings”. Another thing the handheld IR camera allows is for “studying different physics phenomena”. I have no idea what type of physical phenomena you can observe with this little gadget here, but it has definitely piqued my curiosity. Something tells me it could open up new scientific worlds like a microscope or a telescope. The i5 IR Camera features a 2.8 inch screen, a microSD memory storage slot, as well as a Li-Ion rechargeable battery. Now, here’s the bad news, the Extech i5 IR Camera will cost you. And by cost, I mean in the neighborhood of $2,995.00. You had better be needing it for your work for that kind of money. I wonder if such technology can be implemented into a cell phone. That would be cool, especially with a large touch screen display like the one on the krave. (motorola.com/krave) I became a huge fan once I started working with Motorola. It’s got way too many features to talk about, but my favorites are the touch screen display and 2 megapixel camera.